Not really, actually, but I HAD been seeing people post and post and post about pull-apart breads, both sweet and savory. I was a little intrigued, but I don’t really do anything with bread. Even ready-made stuff…I don’t know why. I’ll think of why sometime. 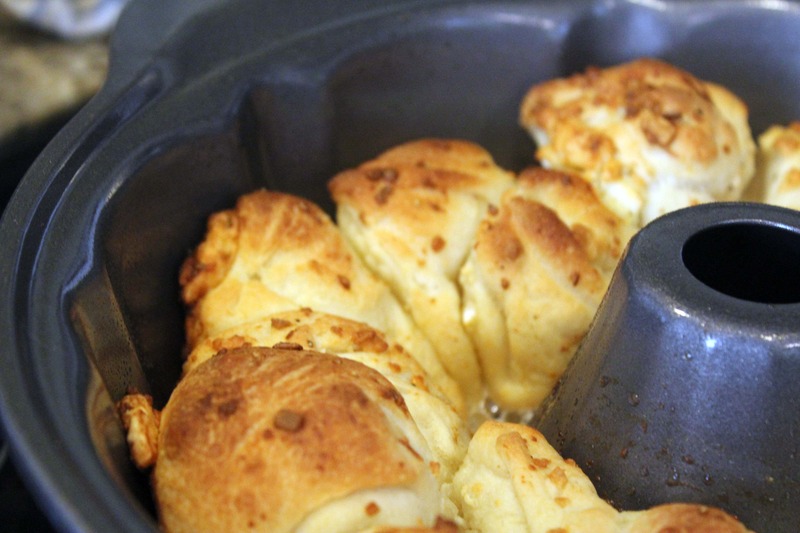 But, when I asked on Facebook last week what new tailgating recipes I should test, my friend Sarah suggested a pull-apart bread! Well, I was in mainly because I made something to dip bread in, and I wanted a SPECIAL bread for it. I’ll tell you about the dip tomorrow, but be aware that it contains lots of hot sauce and looks like this. So, the bread. It was simple, and wonderful, and SO delicious. And it completely fell apart. No, really. There was no pulling involved. This likely happened because I didn’t use a recipe and was impatient and cocky and just threw some stuff together. Also, I used a whole stick of butter. I do think that the bread fell apart due to too much butter, but THEN I started thinking. People pull off bread, take a bite, and their fingers come REALLY FREAKING CLOSE to their mouths. Then they use the same fingers to pull off more bread. Listen, I’m not a germ-a-phobe, but having small bites of a snack that were already separated and might prevent lots of germs from spreading doesn’t sound like the worst idea this time of year. So, my advice is this: if you want a bread that stays together in a fancy loaf, use half the butter, and allow 30 minutes for the bread to rise – this’ll allow the dough to stick together a bit before you cook it. 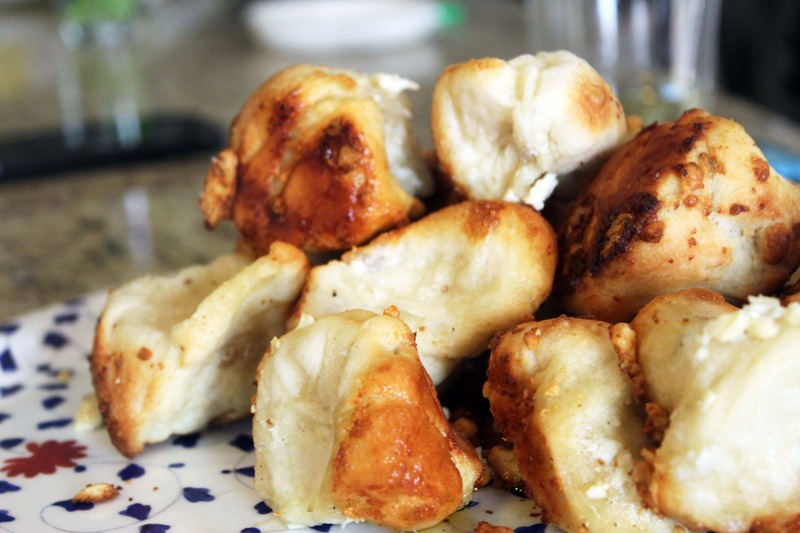 If you want super buttery cheesy bites of bread that are sort of like rustic dinner rolls….this is TOTALLY for you. 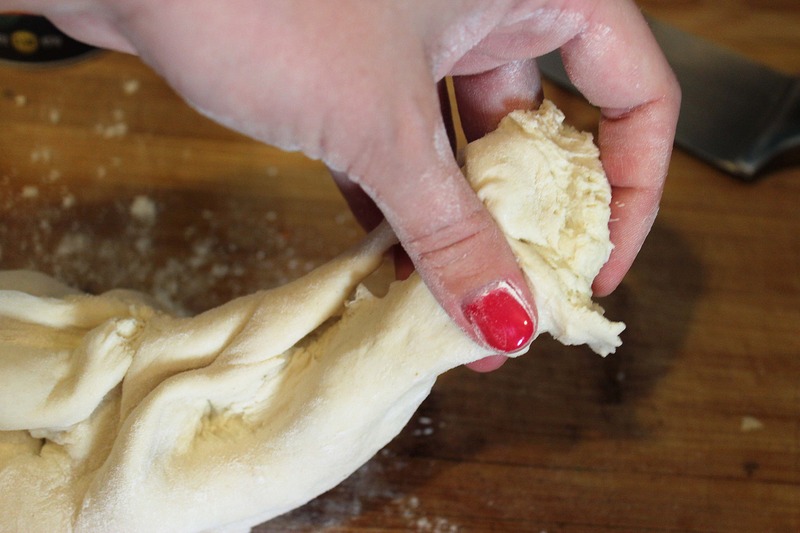 If you use chilled dough, be sure it rests on the counter for 30 minutes or so to come to room temperature before you start this. When you’re ready to go, preheat the oven to 400F. I love a Bundt pan for this, but you can use a loaf pan if you’d like! That might result in a “stronger” loaf, to. 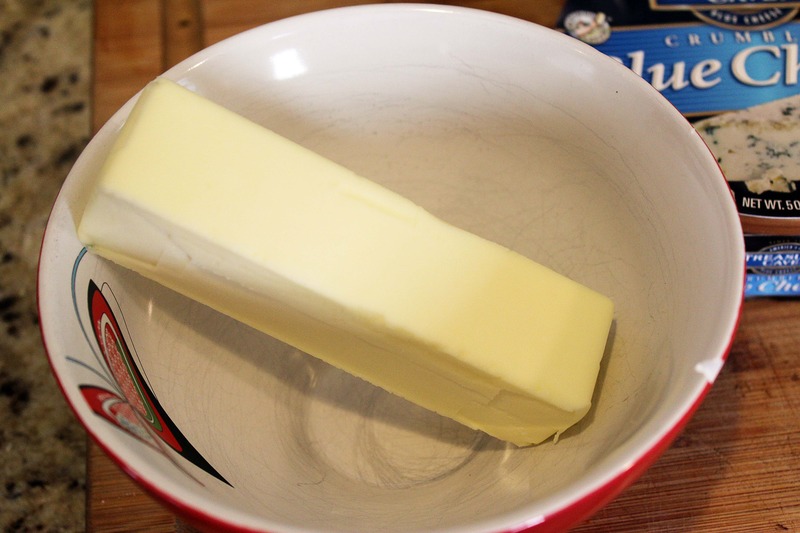 Make the butter mixture first. 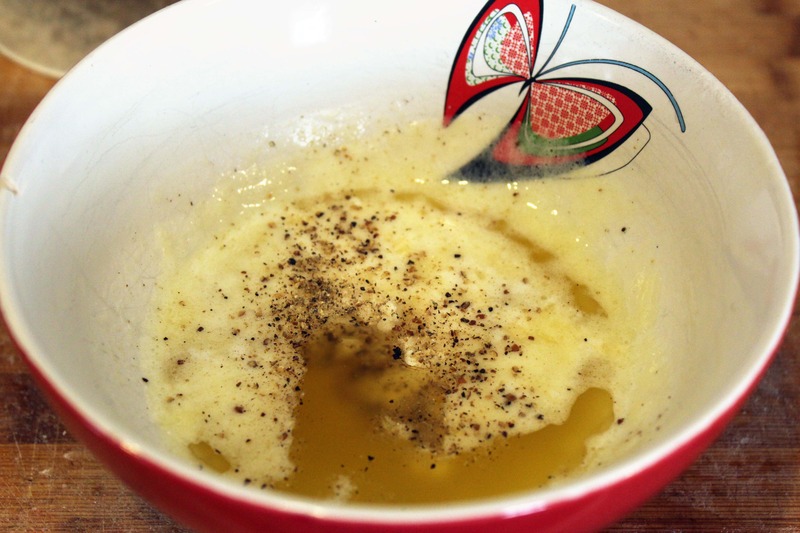 30 seconds at a time, microwave the butter until it’s melted but not boiling. 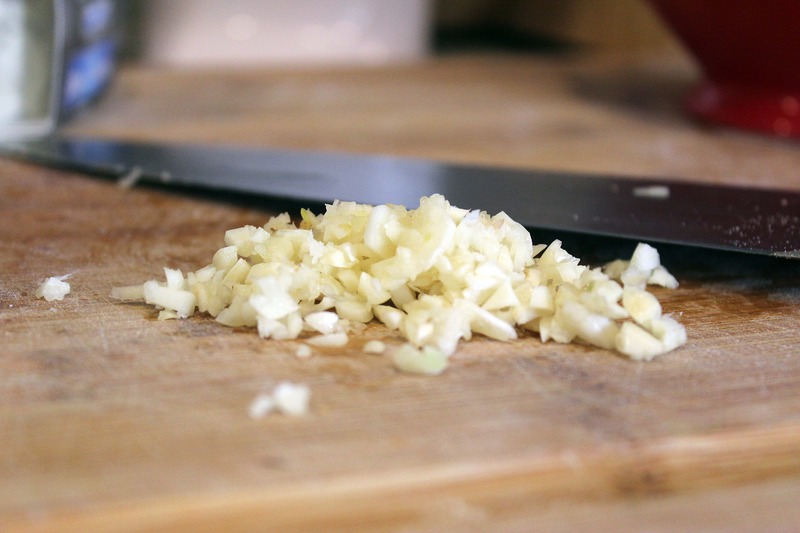 While the butter is melting, mince the garlic. Add the garlic and a little salt and pepper to the melted butter. Taunt the dogs and your boyfriend with it. Then, onto the dough! Spray whatever cake or loaf pan you’re using with cooking spray, then put the pizza dough on a board with a little flour so it doesn’t stick to everything. My dough was prekneaded, but knead your dough if the directions instruct you to. 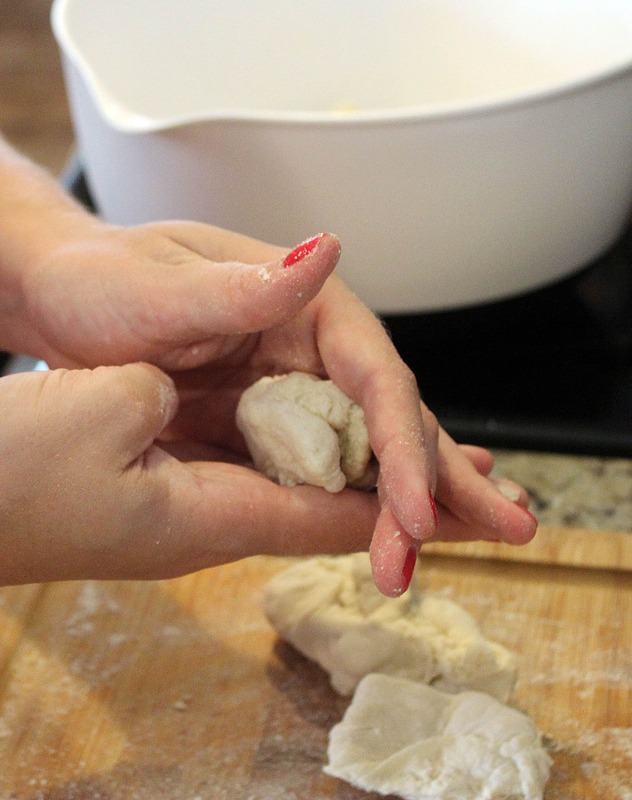 You basically want to be using dough that is ready to cook – follow your dough’s instructions to get it to that point. 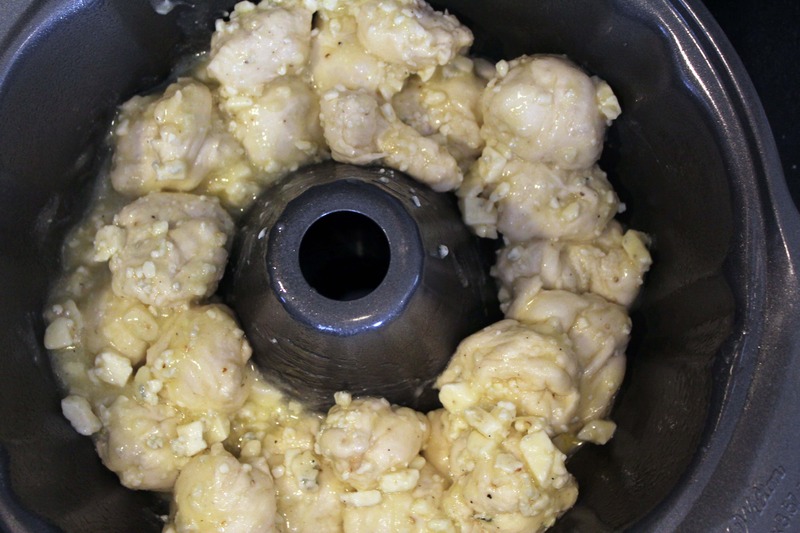 Gently tear off little balls of dough, and lightly mold them to be round – I went with about one ounce portions. 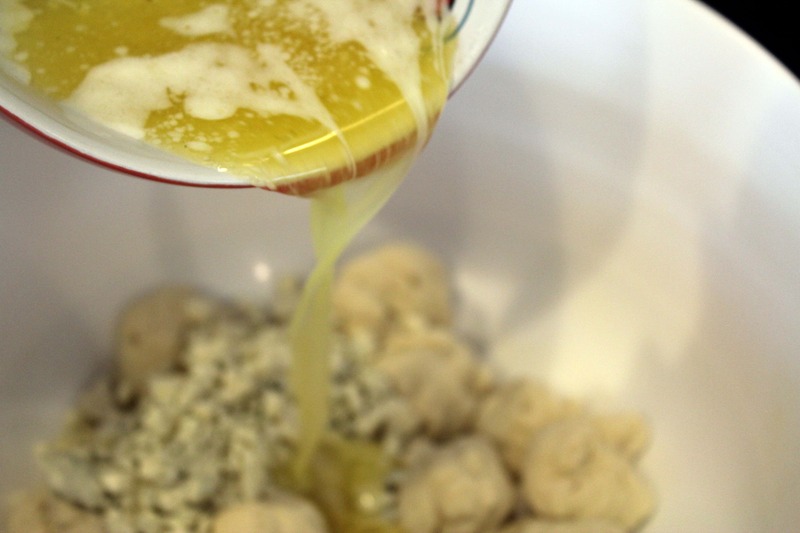 Put the balls of dough in to a large bowl – they don’t have to be perfect! 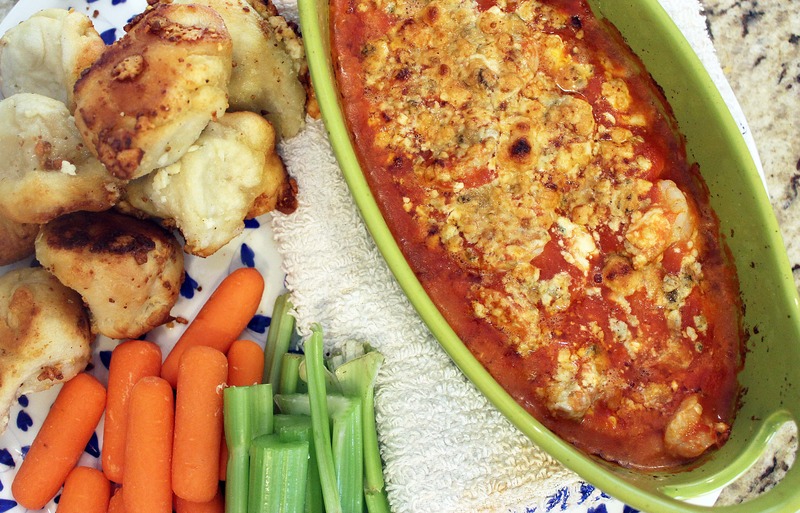 Pour the butter and cheese crumbles all over the dough and TRY not to start eating right now. Please. 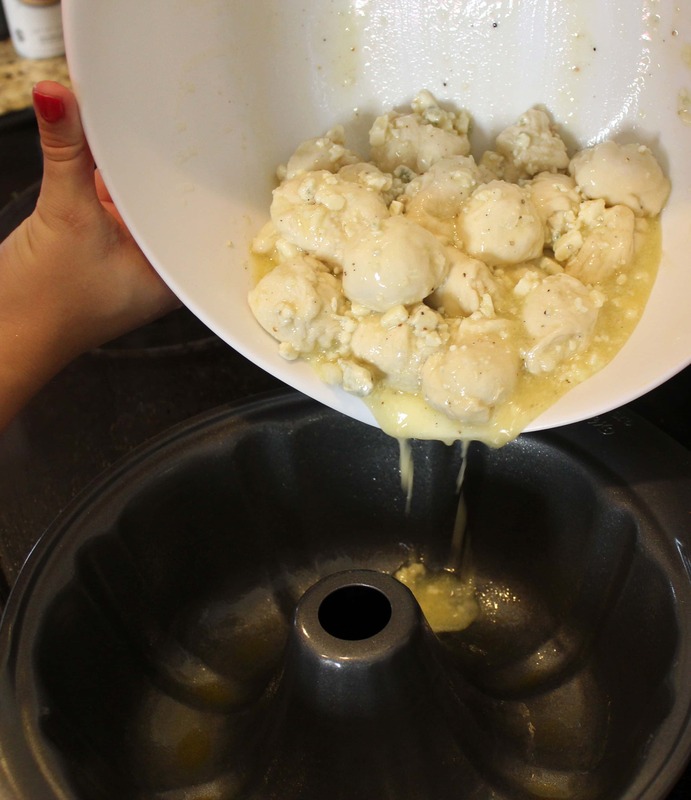 Gently mix the butter and cheese so that each ball of dough is covered, then pour the whole amazing mess into the prepared baking dish. 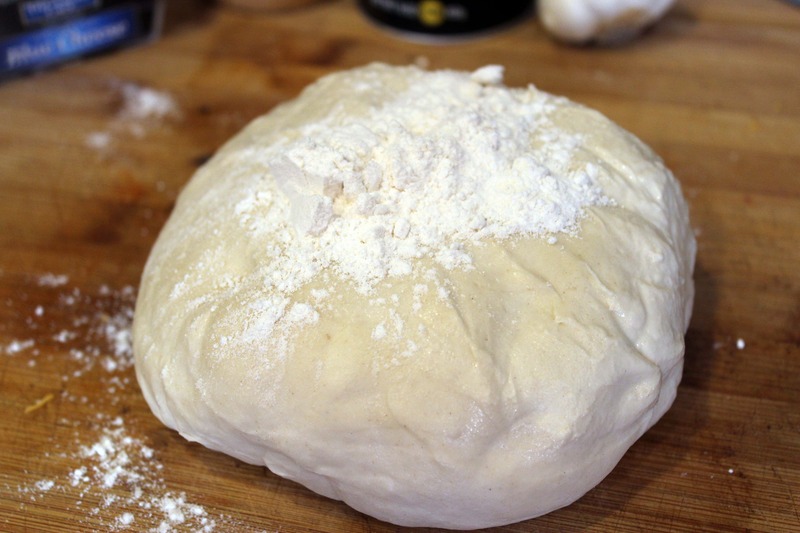 Let the dough rise for a few minutes, or go ahead and bake the dough – mine was perfect with no rising! Bake for 15 – 20 minutes until the dough is golden brown. Let the bread sit in the pan for 5 minutes to set, then turn it out onto a serving platter. WHOA guys. This tasted so great. We basically ate half of this in one sitting, and then had to take the rest to my parents’ house to get rid of it. The best parts, of course, were the ones where cheese was touching the pan. omg Omg OMG. Seriously. 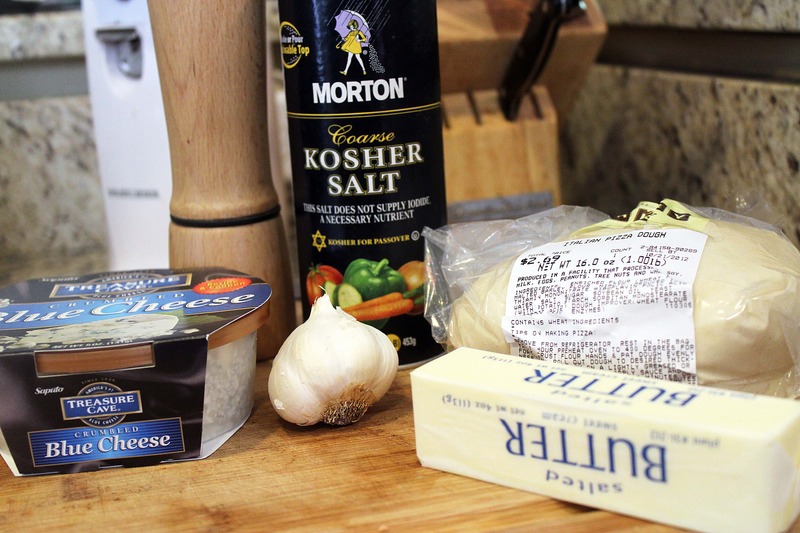 If you aren’t a blue cheese lover, you might want to try this anyway; the butter and cooking of the cheese really mellows the flavor. 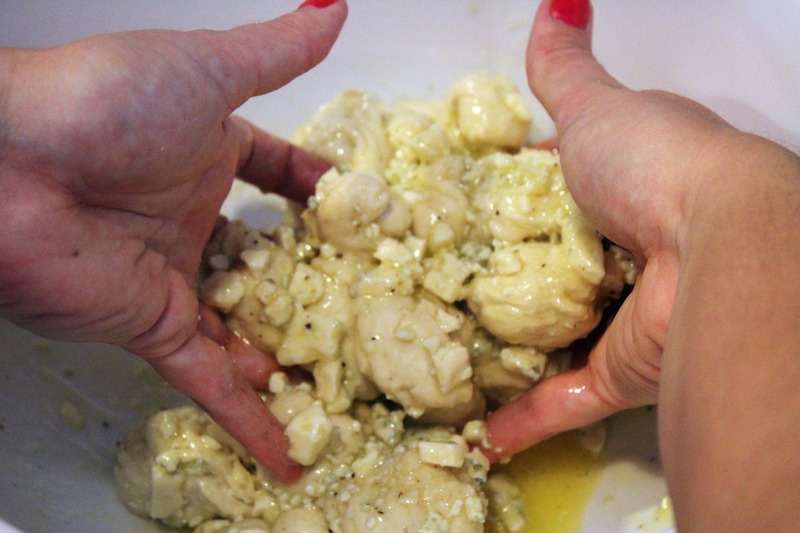 And the garlic…well…kill me, I’ll die happy. This tasted so good that I could not have cared less that I didn’t get to pull it apart with grubby fingers. It was WONDERFUL, and I bet a sweet-cinnamony version would be just as delicious. What’s the best pull-apart bread you’ve tasted or heard about so far? And that’s what I’ll tell you about tomorrow. This is so perfect that I included it in this week’s Weekend Potluck. It’s this cute thing where blogs from EVERYWHERE can submit recipes to share with others – it’s so fun to check out new things!